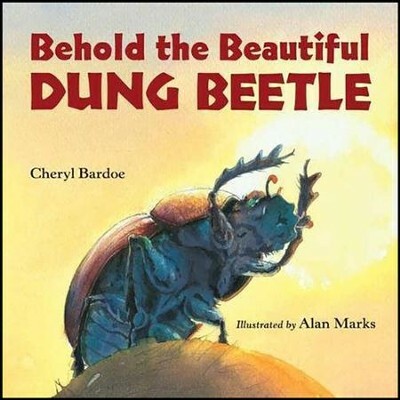 Simple science text and dramatic illustrations give a close-up view of the fascinating world of the dung beetle. When an animal lightens its load, dung beetles race to the scene. They battle over, devour, hoard, and lay their eggs in the precious poop. Dung is food, drink, and fuel for new lifeas crucial to these beetles as the beetles are to many habitats, including our own. 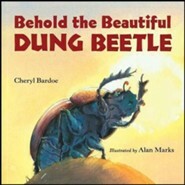 Cheryl Bardoe is the author of two Orbis Pictus Honor books, Mammoths and Mastodons: Titans of the Ice Age (Abrams, 2010) and Gregor Mendel: The Friar Who Grew Peas (Abrams, 2006), as well as The Ugly Duckling Dinosaur: A Prehistoric Tale (Abrams, 2011). She lives near Hartford, Connecticut, with her family. I'm the author/artist and I want to review Behold the Beautiful Dung Beetle.